Stock #PLA111: IMMACULATE!!! Antique Style Engraved ring.....Platinum.... 1.5 CARAT T.W. 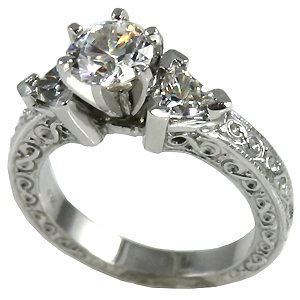 RUSSIAN Cubic Zirconia.... 1 carat center w/2- .25ct Trillions...Gorgeous hand-made Wedding set!!! Beautiful, Hand-Crafted, top quality Jewelry workmanship!!!.... Nice heavy ring, shank, & prongs... matching band #PLA108 or #PLA107 available.Also available in 14k White Gold or 14k Yellow Gold.